William Wotton (1666-1727) had an interesting approach to Jewish texts, and himself translated and annotated two mishnah tractates into English (see here). He did not originate this perspective (he refers to the Latin translation of the Mishnah with the commentaries of Bertinoro and Maimonides by Surenhusius (1664-1729), who preceded him), but was a premiere advocate of it in England. In essence, he believed that the Mishnah is "a noble and authentic collection of what the Jews have built upon Moses's law in every particular" and could be reliably depended upon with a firm historical basis, and because of that be used to illuminate the meaning of the Pentateuch and many passages, customs and words that are found in the New Testament. As for his suggestion to avoid the order of the tractates, it should be noted that in Jewish study the order of the Mishnah tractates are generally paid no heed as well, unless someone is particularly attempting to study them all. For more info, consult David B. Ruderman's work. *And I don't mean Dubno--read on. I had previously posted a small excerpt from a fascinating article (from 2000) about שלמה מדובנא, also known as Solomon (or Salomo) Dubno (1738-1813). He was one of many Polish scholars living in 18th century Germany, where it was easier to make a living teaching Jewish children, than it was in any fashion at home. In contemporary sources much scorn is directed at these men, most of whom taught in Yiddish to German-speaking children, and did not use modern educational methods. This was seen by would-be educational reformers as a continuing problem for Jewish society. However, some of these Polish-born teachers were very erudite scholars, our subject being one of them. He was an expert Hebrew grammarian, Bible exegete and bibliophile. Like many, if not most, rabbis of his time he was pious as well as learned. It happened that he was employed by Moses Mendelssohn to teach his son (at that time he had only one living son), and a friendship developed between them. The specifics surrounding their decision to collaborate on a Pentateuch translation, with commentary is not directly relevant, but ostensibly the project was initiated by Mendelssohn for the benefit of his own child, although sometimes he claimed (admitted?) that it would also serve the education of children generally, allowing them to read a *Jewish* Bible translation in their own language, instead of Christian ones. In any event, the plan was for Mendelssohn to do the translation and Dubno to write the Hebrew commentary which could explain the choices in the translation (essentially peshat-oriented gleanings from Rashi, Rashbam, Ibn Ezra, Radak and Ramban) as well as appending a technical massoretic commentary, to be called Tikkun Soferim, which would be derived in large part from earlier massoretic works like Syag le-Torah, Ohr Torah and Minchas Shai. As was the custom in those days, preparing a new book required advanced subscriptions for financing. The best way to sign people up was to have a sample product to show, so they planned one with some sample pages of translation and commentary, as well as an introduction, penned by Dubno. It was released under the title עלים לתרופה. In addition, Dubno was to pen an introduction to the Pentateuch, to be included in the final product. This he did, however Mendelssohn felt it was too arcane and technical and refused to allow it to be used as the introduction. In addition, he realized that the commentary work was too much for one person, so he enlisted others (see below). Dubno insisted his introduction be used, they fought, Dubno said "See ya," and Mendelssohn wrote his own introduction (which also contained a technical section, based on Dubno's introduction) called אור לנתיבה (A Light for the Path, relating to the name of the Pentateuch itself, נתיבות שלום, Paths of Peace). Dubno had already written the Genesis commentary, as well as most of Exodus. I am not sure what the story with intellectual propery was in those days, but evidently Mendelssohn had the Genesis commentary, he completed and edited the Exodus commentary himself, and received a Leviticus commentary from his friend Hartwig Wessely, and commissioned one on Numbers from the little-known Aaron Freudenthal of Jaroslav, and a commentary on Deuteronomy from a later-to-be-well-known Herz Homburg. The edition was published with 750 advance subscribtions sold (including, incidentally, one to Dubno). A great to-do ensued, with censures and near-bans and (reported) burnings, mainly having to do with the perception that the German translation was intended to teach literary German to uncorrupted Jewish youth, but also because Mendelssohn had failed to seek rabbinic approbation for the prospectus (the Pentateuch itself came with approbations). In fact, it seems the only reason why it wasn't banned by one of Mendelssohn's chief antagonists, R. Rafael Ha-kohen of Hamburg, was because one of the subscribers was the king of Denmark. As Hamburg was then under the Danish crown, it was impossible for a rabbi to ban a work that has been subscribed to by the king. In any case, despite this it was a success (in all senses of the term, including actually teaching many an eastern European student in the 19th century German) and went through many editions and reprints over the next 125 years. Meanwhile, Dubno had removed to Vilna. Being a great scholar and having written excellent commentaries, he decided to publish his own edition of the Pentateuch. For this he received much rabbinic acclaim and gathered many outstanding approbations. To the present-day yeshiva world, one of those approbations stands out, namely that of R. Chaim of Volozhin, outstanding pupil of the Gaon of Vilna and founder of the modern yeshiva. Although Dubno had split with Mendelssohn, this fact remains jarring to whomever from within that world knew it. Associates of Mendelssohn, and a Bi'urist, would not seem to merit approval from the greatest representatives of the Lithuanian yeshiva world. And yet. Until-- a new interpretation of Dubno's split with Mendelssohn was able to be propounded, based on a re-examination of materials relating to Dubno; a letter from him to Wolf Heidenheim, and an approbation for his Pentateuch. Essentially, the interpretation is as follows: Dubno was a good guy who got involved with a bad one. Eventually (perhaps due to the influence of his own rabbi) he decided he needed to part company from Mendelssohn. For his part, Mendelssohn also really felt that Dubno was "too frum," and he too really wanted to push him out, so he made up excuses about Dubno's introduction being too technical to publish. With that neatly in place, everything is explained. Now, the author of this theory, R. Dov Eliach, is not a simple person. He knows how to conduct original research and to consult primary sources. My issue here is how he chose to skew them to bolster his interpretation. In his article we find SJ Fuenn subjected to scorn. Fuenn was a moderate maskil from Vilna, but like almost all maskilim, he was a huge fan of Mendelssohn, and tried to publicize the rabbinic perspectives that were favorable toward him (much the way Meir Hildesheimer's excellent and comprehensive articles on Mendelssohn in the eyes of 19th century rabbis were, with a crucial difference: not having a personal stake in it and not being a Lithuanian maskil, Hildesheimer illustrated all perspectives, positive and negative). this included publishing the approbations for Dubno's Pentateuch, which were in his possession. Eliach notes that Fuenn withheld all the approbations. Which approbations were not printed? Ones which mentioned the scandal in Germany, where rabbis were displeased with the Bi'ur. In addition, these approbations posit that Dubno's edition could limit the reach of Mendelssohn's. Fuenn's purpose was to show leading Lithuanian rabbis and students of the Gaon of Vilna favoring Dubno whose association with Mendelssohn was well known. Presumably mention of the scandal did not serve this purpose. Eliach is certainly correct that this is why Fuenn did not print such approbations. Now, Eliach wrote this article in response to an accusation that HE withheld any mention of Dubno's receiving a haskamah from R. Chaim Volozhiner in a prior article so as not to publicize the association of Dubno with a student of the Gaon like R. Chaim. In other words, he was accused of doing just what Fuenn did. In this article it seems that Eliach came to appreciate Dubno, so his tactic was to sever him from Mendelssohn (using facts and interpretations). However, it seems his preference was to not mention Dubno to begin with! When pressed to do so, you have the above article. In closing, Eliach gives the reason why he did not mention R. Chaim's haskamah to Dubno: at the time he didn't trust Fuenn, and needed to confirm it from another source! And a source he did find afterwards. Unfortunately, this second source is a maskil, so rather than denigrate him like he does Fuenn, Eliach chose to pretend that this second source is not maskilic, but that of a traditional rabbi, and presumably the vast, vast majority of the readers of Yated Ne'eman would have no idea whatsoever. Therefore Eliach portrays another figure, who also published approbations, in an entirely different light. SJ Fuenn is not a "R'" or a "Reb," of course. But the other fellow, Gabriel Jacob Polak from Amsterdam is "R' Gavriel Falk[sic]"1. Now, I'm not saying there is anything wrong with Polak, but to Eliach there ought to be! Namely, he was just as much a maskil as Fuenn. Polak, a printer and scholar in Amsterdam, was not a Chareidi rabbi, nor was he a kind of Hirschian rabbi. He was a participant in the literary republic of 19th century European haskalah, and of course did not pretend otherwise. However, he lived in Amsterdam and not Vilna. As you can see, Polak calls Mendelssohn הרב הרמב"מן ז"ל. This isn't proof that he was a maskil (which he was)-- it just illustrates the point. What is the motivation to portray Gabriel Polak as "R' Gavriel [Polak] of Amsterdam"? The result of this is to authenticate both ledgers which place Reb Shlomo Dubno in his correct light, exonerating his character and repudiating Sha"Y Fein's accusation that the Gaon and his circle admired haskalah. It is unclear why it took another source for the approbations to write about how they existed at all. It is further unclear why Gabriel Polak is a clean, corroberating source to someone who automatically suspects people like him and Fuenn. Of course, it is a neat trick to simply call him R' Gavriel Falk and then that problem isn't there. It is known that all the individual members of the Berlin haskalah were tainted with either false ideas, Bible criticism, reform-style demands for change, or a combination of these. Reb Shlomo Dubno however, has never been accused of harboring any such ideas. His sole occupation was with Torah, either in explaining the pesukim according to the rishonim or studying their grammar and the traditions for reading them. Throughout his life, he was scrupulous in his mitzvah observance. A list of the volumes and manuscripts in Dubno's library, which was published prior to the library's sale in Amsterdam in 5574 (1875), contains the names of many works on kabolo, which their owner studied during his lifetime. This is further evidence of his dissimilarity from his former colleagues, who denied the authenticity of the kabolo to a man. (This was pointed out to me by my friend Rabbi Dovid Kamenetsky. I'm sure the examination of Gershom Scholem's library would show many works of kabolo, too. In addition to kabbalists, two other kinds of people would possess kabbalistic works: people with an academic interest in kabbalah, and people with an ideological hostility to it. In any case, is it true that Dubno's former colleagues "denied the authenticity of the kabolo to a man"? Certainly Yitzchak Satanow didn't, being as he was an enthusiast of kabbalah who even defended the antiquity of the Zohar against R. Yaavet"z Embden. A quote from him: ""This Book of Zohar is great and vast. There are in it allusions and uncountable items of divine information built on the foundations of true intellect . . . which were spoken in divine secret with greater force and greater strength than what philosophical speculation spoke, as is known to one who contemplated them with reader and knowledge of their inner intention according to their truth, and the words are ancient." I've never heard of Wessely voicing a complaint against kabbalah. It is certainly true that stereotypical maskilim denied the authenticity of kabbalah, but it cannot be said that this applies to a man. Furthermore, Dubno's possession of those texts prove nothing regarding his attitude toward kabbalah. Edit 2011: See this post where I more thoroughly attempt to debunk Eliach's point here, by noting that Mendelssohn himself apparently upheld the authenticity of the Kabbalah. 1 The article, incidentally, was apparently translated from Hebrew. The translator made certain errors which are not Eliachs fault. For example, Shmuel Yosef Fuenn [or Finn] became "Fein" in this article, because the translator had no idea how to read פין, presumably having never heard of this person. In edition, Gavriel J. Polak became "Falk," because פלאק was misunderstood for the same reason. However, the latter error is more easily understandable. See the title page shown above: someone actually crossed out "פאלק" and penciled in "פולאק." If you're Korean and want to hone your English, why not use a fairly obscure hundred year old text about the flowering of modern Hebrew literature? "Webster's edition of this classic is organized to expose the reader to a maximum number of difficult and potentially ambiguous English words. Rare or idiosyncratic words and expressions are given lower priority compared to "difficult, yet commonly used" words. Rather than supply a single translation, many words are translated for a variety of meanings in Korean, allowing readers to better grasp the ambiguity of English, and avoid using the notes as a pure translation crutch. Having the reader decipher a word's meaning within context serves to improve vocabulary retention and understanding. Each page covers words not already highlighted on previous pages. If a difficult word is not translated on a page, chances are that it has been translated on a previous page." Rabbi Moses Edrehi (1774-1842) was born in Morocco and spent several years traveling and living in Europe while, apparently, on the way to settling in the the land of Israel. He wrote several Hebrew works (Yad Moshe, Toras Chaim and Ma'aseh Nisim). Apparently he became quite popular in England, being a very interesting character. The last named work of his, having been printed in Amsterdam in 1817, was translated2 into English and published in London in 1834 as "The Book of Miracles; Being an Important Account of the River Sambatyon in the East." The book was a pet project about a very important issue to him, namely the whereabouts of the Lost Ten Tribes. Bibliophiles will note and appreciate his stated use of the library of Salomon Dubno in Amsterdam. The book, which was printed with the money raised from subscriptions, begins with several approbations (called "certificates") from non-Jewish and Jewish acquaintances attesting to Edrehi's good character and the interesting content of the work. Below is one from the Spanish-Portugese Chief Rabbi Haham Rafael Meldola (who died in 1828, two years after writing this, which shows how long it took for the book to actually be published). There you have it. An"extremely orthodox river." This in an English translation of Tseʾenah U-reʾenah, no less! The book is well worth reading, it is very, very interesting. A 2nd edition was printed in America in 1853, and you can download that version here. At the end is appended his ethical will to his children. It contains the usual exhortations to study Torah, give tzedakah and ma'aser and a command to raise funds for the establishment and maintenance of a yeshiva (not in the modern sense, of course; his vision is for a steady group of at least ten). Spanish; 3d, Italian; 4th, High German; 5th, French. You can read a very positive review of the work here. For more information about him, some of which is quite sad and some of which is highly unfortunate, see here. Apparently after many years of misfortune he achieved his goal and arrived in the Holy Land in 1841. 1 The Sambatyon is a legendary river of rabbinic literature, which is cannot be crossed six days a week due to raging currents which spit up boulders. However, the waters are still every Satruday. Beyond the river Sambatyon live the Lost Ten Tribes of Israel! The connundrum is apparent: neither they nor other Jews (all of whom were assumed to be Sabbath-observant) can cross on Saturday, the only day it would be possible. In legend, the Ten Tribes live a kind of idyllic existence, much like the dreamed-of Messianic future. If you're childhood yeshiva education was like mine, you were taught that such a place definitely exists. The problem is, if you violated Shabbat and crossed it, you'd promptly be tried and stoned. Josephus has a parallel to the Sabbath River, basing himself on Pliny the Elder, only his is dry six days a week and fills and flows every Shabbat. In Edrehi's book, he notes that he personally has seen sand timers made of gravel from the Sambatyon--and it doesn't move and it doesn't work on Shabbat! Last year there was a widely reported hoax about the discovery of a never-encountered Amazon tribe. This blog referred to it as a positive sign regarding the Sambatyon, being that previously unknown corners of the earth are still being discovered (via). That may be, but this lost tribe in the Amazon wasn't really undiscovered. It is interesting to note that in the late 1830s a group of four young whippersnapper maskilim of Lemberg published two volumes of attacks, called Ha-roeh [The Spectator and Critic of Contemporary Works], on the scholarship and religious commitment of the heavyweights of their time (eg, Shir Rapoport, Samuel David Luzzatto, etc.). Among the charges leveled at a scholar (none of the aforementioned) was that he denied the existence of the Sambatyon, contra the Talmud! While this might sound amazing today, and it might also seem amazing that R. Moshe Edrehi garnered such an interested audience, it should be borne in mind that in the first part of the 19th century the world was not a global village, and Europe had begun making forays into the unexplored corners of the Asia and Africa (we'll not discuss the horror they brought in their wake). Quite literally every week new and amazing things were brought to the attention of the European literary world. New peoples, new customs, new artifacts. Humankind's secrets were being revealed to the West. In volume II of Iggerot Shadal there is a letter from Luzzatto to Abba Isak, an elder Ethiopian Jew, with a list of twelve questions about their heritage and beliefs. It was written in 1849 and is reminiscent of such famous epistles as Shemuel ha-naggid's to Joseph, king of the Khazar Jews. Not quite the way one relates to the remoteness of the world today. Thus, it hardly would have seemed unlikely to many that there really is a Sambatyon. 2 It remains unclear to me if he himself translated it. At the very least, he must have had someone review and edit his text, if the translation was his own. On the one hand I'd want to tell the OU that the public is watching and knows what you're doing, but on the other hand, I don't know what they're doing. On the Main Line reader who subscribes to the Jewish Chronicle? If this is you, please email me. My address is at the sidebar, below the picture of Mississippi Fred. A while back I promised a post about the popular Jewish history books of R. Berel Wein. First of all, let me make clear that whether he is a "historian" or not is immaterial. I say this because I have seen him dismissed because he is an amateur history buff. Well, so am I. It's hard to know where to begin, so let's just begin in the middle of things. One bone I have to pick is R. Wein's very negative attitude toward his predecessors who essentially created the field of Jewish history. Three or four or ten chronicles over a millenium are not why R. Berel Wein has an abundance of historical materials and libraries full of journals and books to learn about the Jewish past. It is because of the determination of scholars, Jewish and non-Jewish, to uncover the Jewish past using modern research methods. I will get back to that point, and show specifically how he shows no appreciation for the pioneering work of those who came before him, but in the meantime, I want to mention that his books constantly cite "neutral" scholarly historical works about the time periods he discusses. The scholars who wrote those books and studies use the same modern research and the same critical methodology as the Jewish scholars whom he disapproves of. Furthermore, although he is very dismissive of the early generations of Jewish historians and scholars who created and worked in Wissenschaft des Judentums, many of their successors of the second and third generation after the pioneers are cited by him as authoritative sources. I'm not sure why the work of Abraham Berliner, H.J. Zimmels, Cecil Roth, Irving Agus and Jacob Katz are reliable, but not Zunz and others. Yes, I am aware of the flaws and biases that could be found in the early works, but the later work also contains them, and rely on the earlier ones, and most importantly, use the same methods and consider them valid. 150 years removed from the Zeitschrifts it might be easy to pretend that they are not a layer in the foundation of which he works, but they are there. The legend is first recorded in Shevet Yehudah, a historical work written by Shlomo ibn Verga at the turn of the 16th century. Modern secular scholars, as is their wont, disregard the account as fiction. Now, the problem with the legend is that--according to Wein--it first appears in writing 500 years ago. This, in a discussion of events of two thousand years earlier. "As is their wont"? Is it disrespectful to view a report from 1500 CE regarding the political situation in 500 BCE as simply not admissable as a historical source? Incredible. There is no basis, except for the love of Rashi shared by all of Israel, and their wish somehow to be identified with him, for the legend that Rashi visited all the major communities of the Jewish world. Neither is there any basis to the legend that Rashi met Rambam in Egypt. Rashi died in 1105 and the Rambam was born in 1135. Okay, the last bit is just impossible, but what of the first part? Getting back to the legend (Spain fighting in Jerusalem), on the very next page (pg. 27 n. 2) there is a footnote which clarifies that the biblical Hebrew place 'Sepharad' is 'Spain' according to Rashi following Targum Pseudo-Jonathan, "However, many Biblical commentators describe Tzorfas and Sepharad as names of Phoenician or Elamite cities. Nevertheless, in the early Middle Ages, and from then onward, the words came to mean France and Spain exclusively." Thus, we see just how tenuous a legend this is, yet "Spain's influence was known in ancient Israel" and the skepticism of "modern secular scholars" about the historicity of a legend appearing 2000 years after the fact is sneer-worthy? More posts to follow, including praise of R. Wein's work that I feel is due him. As you can see, here it is explained that the title of his work, מלאכת מחשבת, is also an acronym for משה חפץ שוכן בן-עיר טריסטי. "morì nel 1713 in età di 103 anni," which means that he passed away in 1713 at 103 years of age. de Rossi did not explain his source for this piece of information, but it evidently is the title page. What makes this even more amazing is that the very entry preceding the one for our subject is a short entry for his son who died in 1700 aged 17. If his father did die thirteen years later at 103, that would mean that his son was born to him when he was 73 years old. Not impossible, but not likely! * While sort of true, I jest. The work cites שם הגדולים (pt ii) and ועד לחכמים consistently. But the fact remains that a great deal of the information in the book is just the שם הגדולים put into Italian (although it uses other sources, and de Rossi's own research). Incidentally, this same work mentions the Chida as being aged and still living in Livorno (this from the entry on his great-grandfather). Cecil Roth's eltere zeide -in-law*; London's Ba'al Shem. One of the interesting characters of British Jewish history is the person of the so-called Ba'al Shem of London; alchemist, kabbalist, alleged Sabbatean, miracle-worker, healer, eccentric. As I posted here, his portrait is very often confused with that of the Ba'al Shem Tov. As you can see, the original painting hung in the Roth home! 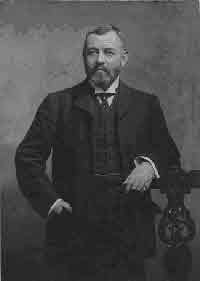 His wife, surnamed Collins, was actually descended from Hirsch Kalisch - the Ba'al Shem's secretary. 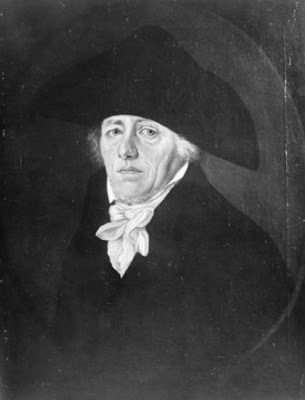 (The name "Collins" was Anglicized from Kalisch.) According to Collins family lore, their ancestor's son married the Ba'al Shem's daughter. Thus, Irene Roth was not only a descendent of Hirsch Kalisch, but also his father-in-law, the Ba'al Shem himself! Incidentally, the reason why he is called "Cain Chenul Falk," in this passage (his name was Chaim Shmuel) must be because for some reason there was an /m/ /n/ confusion, a common enough and explainable error. Perhaps the reason here is because the French author had only heard the name spoken. The /Ch/ in "Chenul," is simply the French for /sh/. Thus, the name is "Cain Shemul Falk," in English spelling. I came across the following description of Hebrew writers in Italy from a review of Della illustrazione delle lingue antiche by Cesare Lucchesini, 1819, in an 1828 edition of The Monthly Review. I was pleased to see the depiction of the Chida as "the principal Jewish writer of Italy." What really jumped out at me was this: "the Philological Commentary on the Pentateuch, by Moses Chefetz, of Trieste, who began printing it when he was a hundred years of age..."
The frontispiece of [R. Moshe Hefez Gentili (1663–1711)]'s commentary on the Torah, Melekhet Mahashevet, displayed a portrait of the author . . . (fig 1). Beneath the portrait appeared a legend reading, “Here is Moshe Hefez’s portrait during the year e”t ben m”ea shana.” Translated literally, the final phrase means, “at the time one hundred years old.” With a quick glance at the portrait, one can easily deduce that R. Gentili is not one hundred years old. Rather, the oversized letters and the accompanying quotation marks indicated that the letters’ numerical value should be used and not their literal translation. Based on this, the legend reads, “Here is Moshe Hefez’s portrait during the year 470 (1710), forty-six years old.” When the work was published in Venice in 1710, R. Gentili was forty-six years old. While the date of the publication is not readily apparent from the portrait, the author’s lack of a yarmulke is. In the second edition of the work, a slightly altered portrait of R. Gentili appeared on the frontispiece (fig. 2). This edition, published in Koeningsberg in 1860, boasted a picture of R. Gentili wearing a large yarmulke. The new portrait also displayed an aged R. Gentili, which conforms to a literal reading of the phrase et ben mea shana, at the time one hundred years old. In the second edition, the letters of the legend indicating the year were not enlarged. Remarkably, the printers published a disclaimer in the back of this edition in which they stated that one should not be upset with them for publishing an obviously incorrect legend “this portrait was done at my one hundredth year” as the printers explain, “we have not changed a thing, this is the way the portrait appeared in the original edition.” Since the printers misunderstood the legend of the original portrait, they were forced to age Rabbi Gentili and then print a disclaimer professing their fidelity. This is a really interesting image, because I say so. Actually, it's interesting, I think, because while it was written in the Arabic alphabet, it uses Hebrew vowel points. The manuscript is Karaitic, and the practice was not uncommon in Karaite writings in Arabic, whereas Rabbanite writings in Arabic invariably used the Hebrew alphabet. It's quite striking, because Arabic has its own system of diacritics. Why Rabbanites chose not to use--or didn't learn--the Arabic alphabet, and why Karaites did, but chose not to use--or didn't learn--the Arabic vowels is an interesting question. Speculators welcome. The tale of אברהם בן אברהם, Abraham ben Abraham, the Polish Count turned Jew and then martyr in 18th century Vilna is well known. This traditional tale was even written in a German language children's book (trans. into English by R. Yehoshua Leiman z"l in 1978, link). Like many stories, the trouble is that this one has never been verified to be historical fact. No record of a Count Valentin Potocki (a true name of Polish nobility) converting to Judaism, much less being executed for it, has ever been found. It is true that by the 19th century this story was accepted as absolute fact among Lithuanian Jews, and there was even a grave in the Jewish cemetary in Vilna--near the sepulchre of the Gaon of Vilna--that was believed to be where the count was interred. I take no opinion on the matter. I'm not suggesting that this is in any way related; I am suggesting that this is interesting. Here is a summary of the historical evidence, or lack of, for אברהם בן אברהם. The Rabbi Mendel in question is Rabbi Menachem Mendel of Shklov, one of the original Perushim in Eretz Yisrael, and a talmid of the Vilna Gaon. Although he was born in 1750, and thus after the entire incident is alleged to have occurred, it is also evident that the story is considerably older than the date it is here recorded. It certainly cannot postdate 1808, when he arrived in Eretz Yisrael, and in fact must predate the death of the Gaon (1797). In fact, to me the way it is mentioned here has all the hallmarks of a story known to R. Mendel all his life, which puts the story even closer to 1749, when it is said to have occurred. This same Radziwil features as a villainous (or at least cruel and stupid) figure in Salomon Maimon's autobiography. Whoever is responsible for allowing the complete Gutnick Chumash (Pentateuch) online, יישר כחך to you!--either author, publisher, or both. Let this also serve as a gentle rebuke to other publishers of popular Chumashim, including publishers which double as a non-profit fit to give one's tzedakah to. This Chumash can be completely viewed and searched, but not downloaded, which seems to make good finanical sense. Of course the bottom line is the bottom line so it is hard to expect the makers of other Chumashim to do the same, but the folks behind the Gutnick Chumash must be specially commended, even if the cynic in me realizes that a partial motivation might be a sense of mission in spreading the Lubavitcher Rebbe's word by making it available (the commentary Toras Menachem adorns the edition, along with a section called Classic Questions, which anthologizes many of the famous commentaries). However, the Gutnick Chumash is a quite good Orthodox Chumash, with an interesting bibliography, which can be perused here. It is light on the Litvaks, truth be told, and delightfully describes the Vilna Gaon as "Lithuanian Talmudist, Kabalist, grammarian, and mathematician." However, the sheer grace of making the entire text available is applaudable indeed. I had planned to review this Chumash a long time ago. Perhaps now that I will be able to do so more easily I will get around to it. 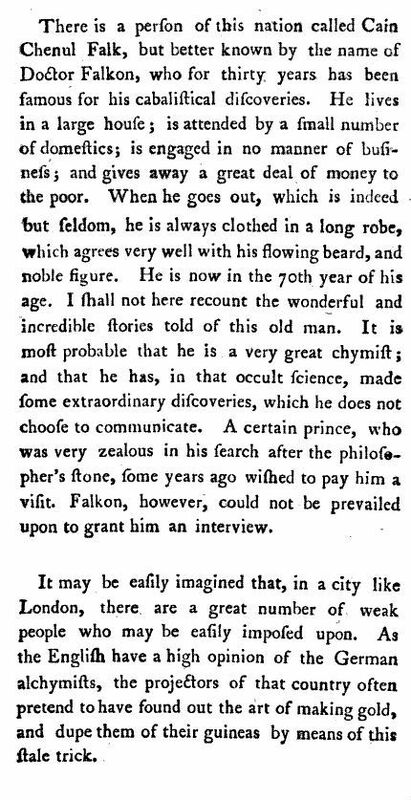 First mention of a Chief Rabbi of New York; May 25 1796. I'll bet you didn't know that New York had a Chief Rabbi 92 years before Rabbi Jacob Joseph moved from Vilna to New York to assume that office. Allgemeine Literatur-Zeitung, published in Leipzig. Fourth line from the bottom; Gershom Mendes Seixas. Merely a few weeks ago I titled a post R. Jonathan Eybeschuetz in a nearly contemporary German periodical , the reference being to an article from 1792. I found an earlier and more interesting book called Abbildungen böhmischer und mährischer Gelehrten und Kunstler, which would seem to mean something like "Pictures of Czech and Moravian scholars and artists," and that is indeed what the book contains. Published in 1773 in Prague, this beautiful book contains many portraits with short discussions about their subjects. Apart from the (token?) two rabbis, I confess that the only one I recognized was John Huss. The rabbis are Prague Chief Rabbi David Oppenheim and Chief Rabbi of the so-called "Three Communities,"Altona, Hamburg and Wandsbek, Jonathan Eybeschutz (here the name is spelled "Ionathan Eibenschitz." Incidentally, the artist seems to be either "J. Kleinhardt" and/ or "J. Balzer." Anyone have information they can share? Balashon has a great post on the origin and correct meaning of the word בירה, as in שושן הבירה. The post has everything I like: Semitic philology, peshat exegesis, Mendelssohnian Bibles, Maharil Zunz, Isaac Leeser and Artscroll. Full disclosure: Dave and I had some nice email exchanges about the subject in question. So, read it! Edit 03-07-09: R. Salomon Pappenheim. See comments. You never know when you'll find something interesting. Just to give you an example of the sort of journal in question, this article is followed by one called Calhoun on Government.